Wouldn’t it be nice if books and movies contained even remotely believable apocalypse scenarios? Sure, a tidal wave that engulfs skyscrapers looks cool in CGI, but a rogue wave is not destroying the whole world. Sorry. There are so many realistic potential causes in existence today that we don’t need to resort to stupid ones, as fun as they might be. This is the beginning of a five-part series on apocalypses. My young adult novel The Initiation, out February 27th, takes place long after an apocalypse. It’s not the focus of the story. Still, I wanted readers to say, “Yeah, that could totally happen.” Not, “I don’t think fruitflies taking over the world is a big risk.” After this introduction, the following four parts detail the causes I’ve found to be the most likely. At one time, this series was offered as an ebook on my website, but I wanted to move it to the blog. 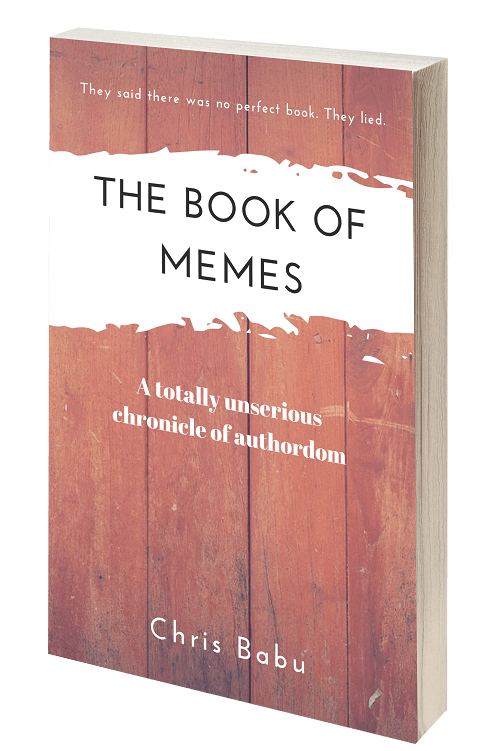 If you’ve already read it, I apologize! Between ancient prophecies, Y2k bugs, wacky preachers, and countless others, it seems we’ve been awaiting the apocalypse for generations. Should it actually happen, it probably won’t be what you think. Like, a nuclear war, or a plague, or that asteroid strike we didn’t see coming until it was too late. It won’t be a natural disaster—earthquakes, supervolcanoes, solar flares. Sure, those make for great terrible summer blockbusters with killer special effects and ridiculously awful plots. But humanity wouldn’t be so lucky to get bailed out by mother nature like that. What a relief it would be if the end of the world wasn’t our fault! See, nothing we could’ve done about that massive asteroid, right? No, the universe doesn’t work that way. It’s a lesser-known tangent of Murphy’s Law: If something disastrous happens, and there’s a chance it was your fault—it was. If a “thing” obliterates humanity, it must be a vehicle of our own creation. It’s only fitting. Karma on a universal scale. Humans have wreaked havoc during our short time on earth, causing irreparable damage to our planet. We’ve treated it like our own amusement park, as if we have the option of leaving when we’re done playing. We’ve also created enough weapons of mass destruction to annihilate the earth many times over. In that sense, nuclear weapons could potentially be the cause, but it’s unlikely. I say that even as two world leaders of nuclear-capable countries are hurling insults at each other like kindergarteners on the playground. Deterrence and mutually assured destruction—Cold War terms that still apply—almost guarantee they won’t. Any country that uses them ensures it’ll be wiped off the map (or one of its allies will) by retaliatory strikes. Therefore, they will not. Even if a regional nuclear war or a plague did kill billions, the population would only shrink temporarily. Population growth is that strong (more on this to come). Scientists Corey Bradshaw and Barry Brook of the University of Adelaide studied this scenario, publishing their findings in the Proceedings of the National Academy of Sciences. They determined that the sudden deaths of two billion people would still result in a global population of 8.5 billion by 2100. Scientists rarely opine on apocalypses. On occasion, they’ll note a huge meteor whizzing by the earth and how sucky it would have been if it smashed into us. Thus, speculation on apocalypses is relegated to the imagination of fiction writers. When you examine apocalyptic fiction, you find authors favor only a handful of causes. Most are of the above type—natural disasters, nuclear war, or a pandemic. Others are simply fantastical, like zombies, monsters, or aliens. Occasionally technology spirals out of control, or robots revolt against humans. For example, in The Terminator, which I love. These sci-fi apocalypse stories are often a metaphor for our over-reliance on technology. They may question the wisdom of subjugating our species to one of our own creation. Cool, to be sure, if not an entirely plausible apocalypse. 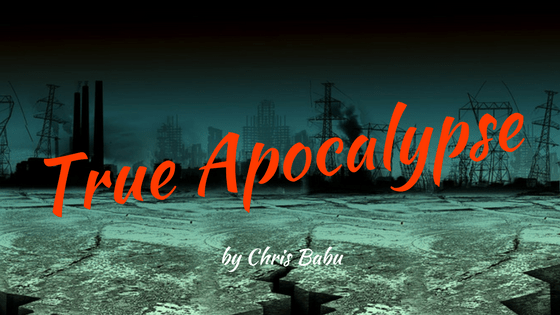 Why Do We Love Apocalypse Stories? They’ve been seducing us ever since… well, it’s a little tough to figure out when we all became fixated on the end of the world. Before the invention of the atomic bomb, there wasn’t much written about it. The creation of weapons capable of extinguishing humanity was a logical catalyst for the genre. While seemingly never out of favor, its popularity seems to surge when the world becomes especially crappy (like, you know, right now). That correlation says a lot about why people love apocalyptic fiction. It explores our worst fears. Often, the stories resonate by highlighting today’s problems and extrapolating them to their worst-case scenarios. While that sounds terrifying, it’s also thrilling. Because at the same time, they usually offer hope. This is especially true because most stories are post-apocalyptic. From The Road or The Walking Dead in the immediate aftermath of one, to dystopian tales long past their apocalypse, like The Hunger Games. Everyone dreams about being one of the few, suddenly-very-special, survivors. It’s captivating to imagine something so dramatic happening to our boring lives. Sure, today I’m picking up my Great Dane’s poop. Tomorrow I could be saving the world! The post-apocalyptic warriors often inspire us by showing how to overcome adversity. Demonstrating that it’s indeed possible, even when the days are at their darkest. And they often put our own problems in perspective. The one common thread throughout most post-apocalyptic stories is the enduring human spirit. We’re down but we’re never out. Our fascination may boil down to a fundamental question: what would we do in that scenario? Would we answer the call to heroism? We’d curl up in the fetal position You betcha we would! The same question applies to dystopian as well as post-apocalyptic fiction. (Keep an eye out for my post on the difference between those first-cousins of genre). Like so many others, I’m infatuated with these stories. From watching Mad Max as a kid, reading 1984 and Brave New World in high school, through The Hunger Games era stories. Katniss and crew spurred a whole new wave of dystopian titles, flooding the market for young-adult dystopian fiction. 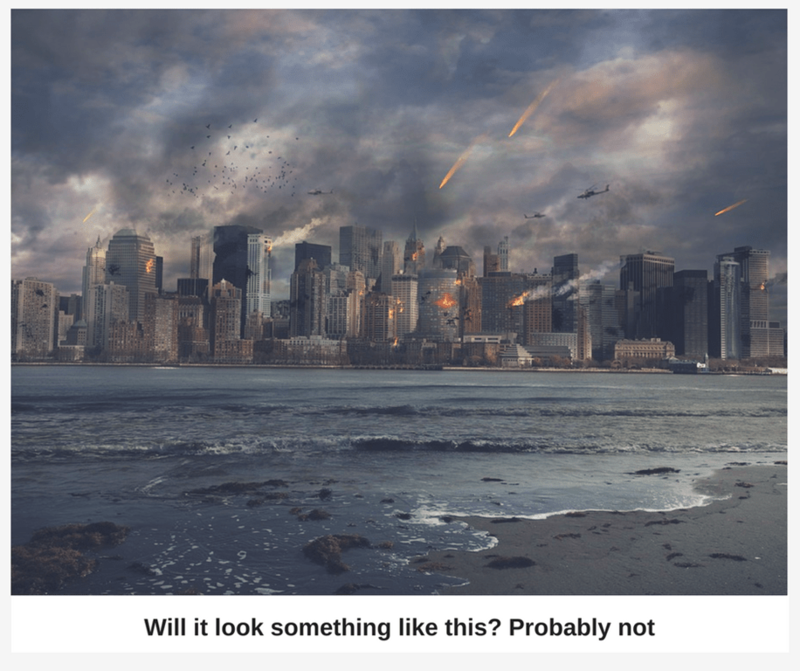 Getting back to the cause of humanity’s ultimate demise… the thing is, even though we’re talking about fiction, authors have an opportunity to craft a realistic apocalyptic event. 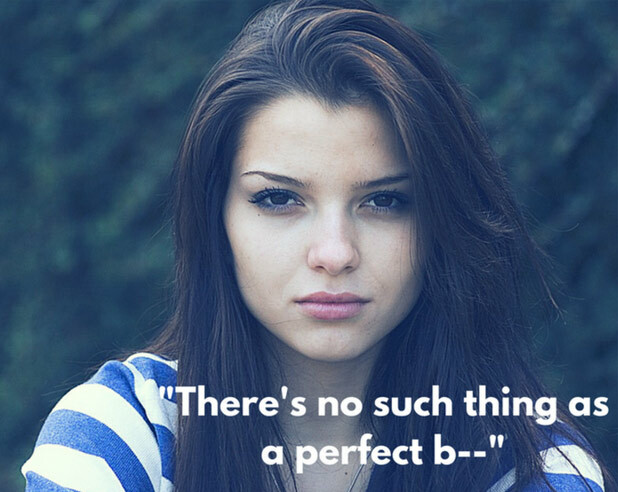 A story does not need to be realistic to be believable. But the dystopian world should be logical, grounded in something. Whatever makes the world dystopian now should relate in some way to what caused the dystopia. There should be some cause and effect. (Of course, some dystopias are not post-apocalyptic, like 1984, but I’m talking exclusively about post-apocalypse stories). Some authors hint at a vague war, or don’t reference an apocalypse at all. Even if it’s not relevant to the plot, I find it unsatisfying when there’s no explanation for the current state of affairs. If a futuristic government is authoritarian as is often the case, or society is ruthless and cruel, or something insane happens on your 16th birthday… how did we get to that point? Surely there’s a reason other than it made a fun story? When I wrote The Initiation, I wanted it to be realistic—not just a believable apocalypse but a story world rooted in realism. I think that’s far more frightening because it could actually happen, rather than a futuristic setting with arbitrary made-up rules. Since the genre typically takes place in the future, it often contains a hefty dose of science fiction. Sometimes the stories feature technology that hasn’t been created yet. Who doesn’t love dreamy new technology? It’s fun, but it can be a crutch that conveniently solves plot issues. It’s jarring and unrealistic when impoverished characters suddenly fire up the teleportation machine and get outta Dodge. I wanted to avoid that. Much of the genre also delves into fantasy, and I sought to exclude that too. My focus on realism needed to begin with the apocalypse itself, even though it occurs well before The Initiation begins. And it must directly relate to the post-apocalyptic world, in a causal way. To create an apocalyptic event that could actually happen, I needed to do a lot of research. The posts following this one are the result of that research. I’ve settled on four causes that, in conjunction, could lead to the end of the world. As stated above, even an event that wiped out billions of people wouldn’t put a major dent in the world’s population. In reality, only multiple catastrophic events occurring simultaneously would wipe out most of humanity. So, for example, a plague followed by a supervolcano eruption, finished off by an asteroid strike. Except those are independent, exogenous events. The chances of them ever happening simultaneously are zero. As I also said at the start, I believe the events will be of our own making anyway. Inequality, superbugs, cyberterrorism, and overpopulation. In isolation, none of those currently-relevant issues would destroy the world. But pushed to their limit, the confluence of them absolutely could (it might even be called the Confluence). Keep an eye out for the upcoming posts which take an in-depth look at each cause and show why they have the capacity to be catastrophic. Have you found the explanations for apocalypses in books/movies to be vague and unsatisfying? Scary and chilling and timely. A post to make us think. Brilliant as always, Chris. Thank you Renita! I think a realistic apocalypse is much more frightening than a spectacular but ridiculous one. “Inequality, superbugs, cyberterrorism, and overpopulation” – very believable, good choices. Probably could of also added global warming. I am looking forward to reading your books.